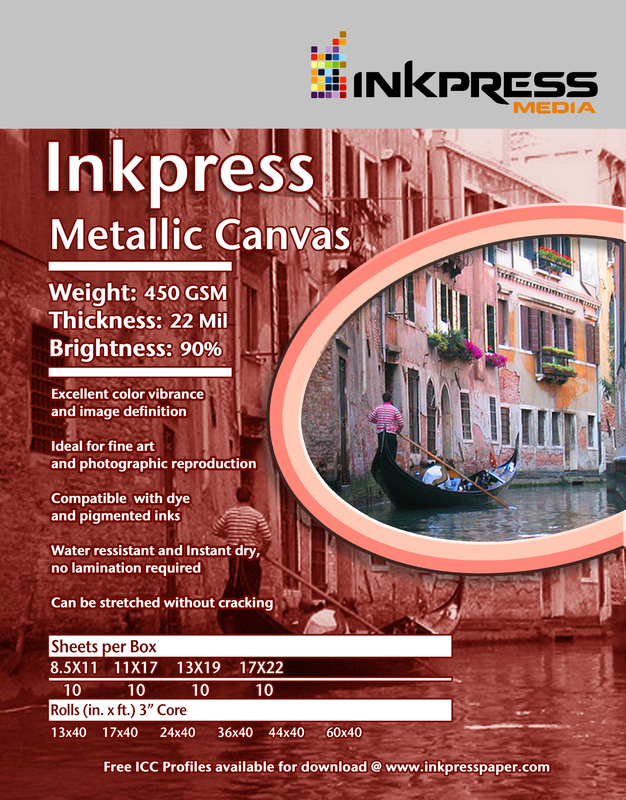 Inkpress Metallic Canvas is a premium gloss poly/cotton blend canvas with a SILVER METALLIC layer.The silver metallic layer adds a new and unique look to portraits, wedding photos,fine art prints, and high quality point of sale images. Excellent tonal range andD-max. 22-mil weight offers supple feel with bright white base. Stretches well andresistant to cracking. Quick drying and water resistantCompatible with all aqueous inkjet printers, dye and pigment inks. The paper (media) setting for LUSTER is: PHOTO PAPER PLUS SEMI-GLOSS (II): (using Canon SG ICCs).